A lot of people complain to me that they just don’t have time for practice. It’s such a shame they think like that. The way that we think creates our reality. So if you think you have no time…well, you won’t seem to have any time. The mind is so powerful, that if we tell it that it’s powerless, or that we have no time, it will promptly create that reality for us. You DO have time to practice. There is always time the practice your jazz guitar. It’s through my incredibly amazing, trademarked innovation, known as the Micro Practice. …Okay, so it’s not that innovative, but it is very useful indeed. Every morning, before you get all shined up and eat your breakfast, go straight to the practice room and put the timer on for five minutes. In that time, completely focus on learning a lick, an extra couple of bars of the transcription you’re working on, or improvise with that soloing concept you read about the other day along with a backing track (that is, of course, conveniently close at hand, ready to be fired up). Then, put your guitar down and go about your day merrily. At lunchtime, grab your git-box that’s been hiding under your desk (out of the view of your boss – I know you have one there), and for 2 to 5 minutes just revise what you covered in the morning Micro Practice. In the evening, just before you go to bed, have another quick revision of the material that you covered in the day in a final Micro Practice. If you’re really focused this should only take a couple of minutes. 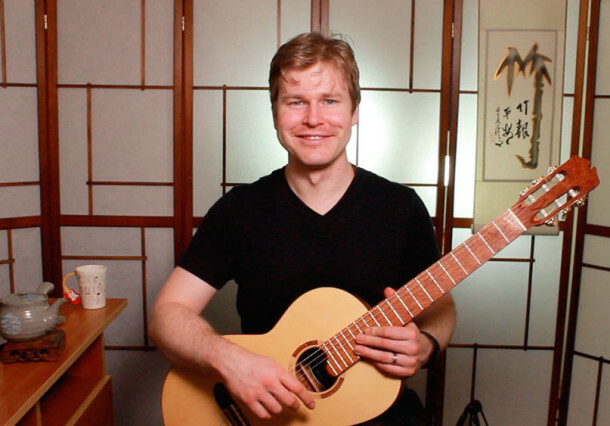 Total practice time = 10 to 15 minutes, split across 2 – 3 Micro Practice sessions. Now I know what you’re thinking here… How could you ever get anything remotely meaningful practiced with these time constraints? This is the ironic thing: you CAN make great progress with this technique and learn a great deal of material over time, despite having incredibly limited time. This Micro Practice technique leverages the way the mind learns most efficiently. From what we know about neuroscience, the brain actually makes all the connections and neural pathways about something after being presented with a piece material. So, by learning a small chunk of something, and then going and doing something completely different and getting on with your day, helps those neural connections grow stronger (interestingly, this technique is most effective if you go and exercise in between practice sessions, or socialise). But to really reinforce those pathways, it’s important to revise the material at periodic intervals, rather than just in a single session. The revision doesn’t need to take very long at all. You can do it in the space of a minute or two and it will have the effect of making the material stick much better than if you only look at the material once. The revision is kind of like watering the garden as opposed to your first session, which is like planting the seeds. Even if you aren’t lucky enough to be able to hide a guitar at work, just close your eyes and visualize yourself playing what you’ve practiced in the morning, revising the material in that manner. It will have a very similar effect of helping to deepen those neural connections that you’ve been trying to make throughout the day. Because when I’m busy dealing with all this crazy technology that I’ve got myself into from running my website, I still make surprising progress and have memorized a ton of phrases, transcriptions and soloing concepts, just though this simple Micro Practice technique. You start to realize how much time you really need to practice guitar. Hint: it’s not much if you’re focused and organized, and understand the way the mind learns. I’ve noticed sometimes in the evening, I go to just practice for only five minutes, and then look at my watch and 40 minutes has flown past without even thinking about it! Sometimes setting a small minimum benchmark can be a good way to trick yourself into practicing more than you thought you had time for. It’s not just the amount of time that you have to practice, it’s actually what you practice. And very quietly, “behind-the-scenes” for a few months now, I’ve been developing a top-secret new program that I’m pretty excited about. It’s basically an all in one recipe for developing every aspect of your jazz playing. Ugh, patience is especially hard to practice when you can hardly sleep because you’re so excited about something.